What are the Student Pages? The RSO Astronomy Level Two Student Pages provide an additional copy of the pages from the Astronomy 2 course that are consumable. This includes all of the lab sheets, Show What You Know quizzes, Famous Science Series research assignments, and Unit Tests found in the main student textbook. The Student Pages are intended for those using the textbook with more than one student. They do not provide anything “extra” to the course. 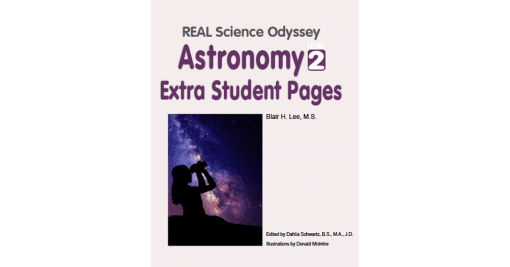 RSO Astronomy Level Two, written by Blair Lee M.S., is a comprehensive astronomy course at the middle school- to high school-level (grades 6 through 10). 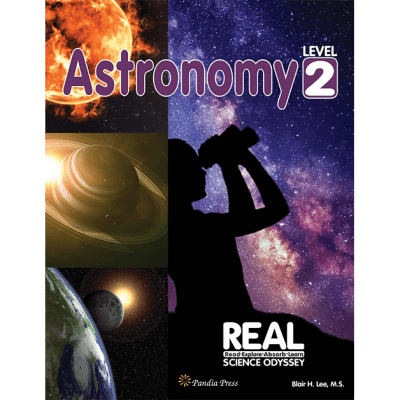 But unlike many science textbooks, RSO Astronomy 2 is not a dry collection of facts and worksheets but rather an in-depth course that engages young people’s minds at the same time that they are actively participating in the learning of astronomy. 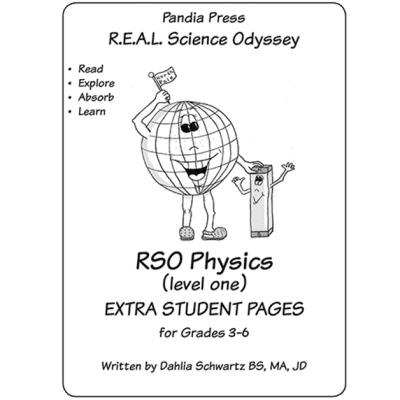 RSO Astronomy 2 has been created specially for home and small group use. The course assumes no science background for teacher or student, and there’s no need for an expensive laboratory. 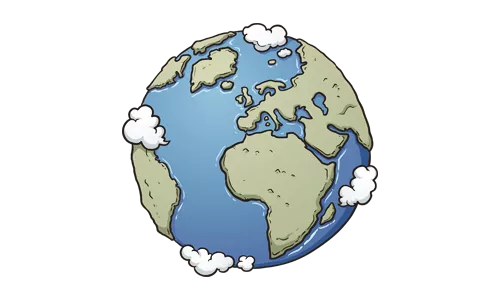 Astronomy 2 uses natural settings that encourage students to explore the world and the sky around them. The materials needed for labs and activities are commonly found items. The course is contained in two books (student text and teacher guide). The student text starts each chapter with an entertaining written lesson that is followed by several components intended to reinforce the lesson, address the needs of different learning styles, and engage students in hands-on learning and research. These components include lab sheets, lab reports, problem sets, activities, famous science research assignments, poetry, quizzes, and tests. 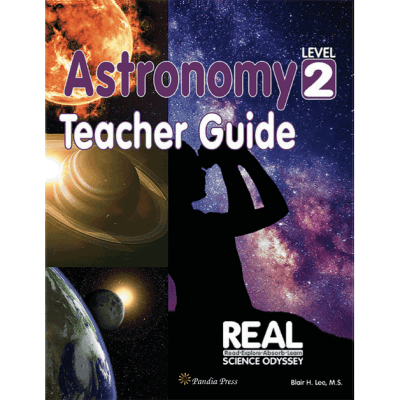 The teacher guide provides all the help a science novice needs to assist her student including suggested course scheduling, summaries, additional material and explanations, sample reports, learning objectives, answers and suggestions, and test answer keys. Divided into 12 chapters, Astronomy 2 provides a complete semester-long astronomy course that is generally completed in 12 to 16 weeks. 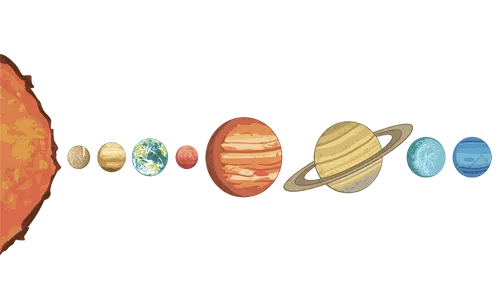 Some lab work, such as monitoring the sun and the moon over an extended period of time, is continued after completion of the main course. 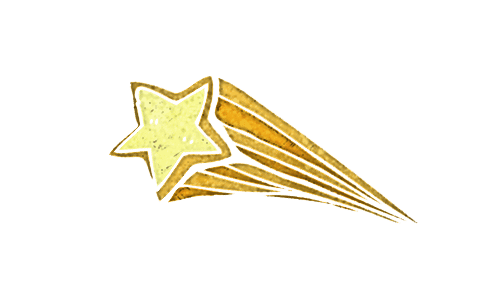 Important Copyright Information: If you choose the eBook version of this course, you are purchasing a?license to use the PDF for your own children. You may make copies for your own children, but you may not share (email, download, print and distribute, resell, etc.) this eBook or any portion of this eBook to others. Licensing is available for group, school, and co-op use. Please contact Pandia Press for details on group licensing ([email protected]). Binoculars– I would avoid the $10 ones, but you don’t have to spend $100. Please see the Teacher Guide Try Before You Buy file for a complete list of the lab supplies needed to complete this course.